Portiko’s 6-foot extension brings two outlets and two USB ports closer to you, wherever you may be. Bluelounge introduces Portiko, a 6-foot extension with two outlets and two USB ports, perfect for shared workspace, living space, and travel. Portiko was designed to eliminate the feeling of being tethered to a wall or beholden to a corner trying to reach power. With its 6-foot extension, Portiko is the perfect length to extend the functionality of an ordinary socket. Changing the way consumers plug-in and power-up, Bluelounge today introduces its new Portiko 6-foot extension complete with two outlets and two USB ports. Ideal for shared workspace, travel or living areas, Portiko expands the functionality of a single socket to create a little hub to work from. The 6-foot extension is the perfect length to reach from an outlet, typically located on a wall, to a desired point in rooms of average size. Each of the two outlets on Portiko bring 110V of power. The two USB ports can be used to plug in smaller devices, with one USB port dedicated to charge iOS devices without losing speed. The low profile, 45-degree angle of the plug makes it easy to plug Portiko in behind furniture while keeping other sockets accessible. It is also magnetic and comes with a self-adhesive metal plate that can be mounted on a wall or desk for secure use and easy storage. Portiko is available in blue or white at a suggested retail price of $24.95. Bluelounge products are currently available online and at select Target stores nationwide. To find a retailer nearby, please visit our store locator. 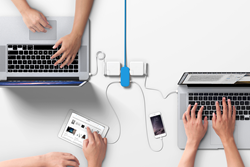 For more information on Portiko, visit http://www.bluelounge.com/us/chargers/portiko/. Follow Bluelounge on Twitter at twitter.com/bluelounge and on Facebook at facebook.com/bluelounge for the latest news on all Bluelounge products. Bluelounge is an award-winning, international design studio known for its clever products that solve everyday problems through design. Each product is designed to provide an effortless solution that stands the test of time and integrates into your life so seamlessly, you can’t remember living without it. Under the creative direction of Dominic Symons, the Bluelounge team is a vibrant collective that champions ingenuity and embraces creativity to fuel innovation. Bluelounge is headquartered in Singapore, with studios in Jakarta, Indonesia and Pasadena, California.